Holly and Jim Galante have been together for many years (50 to be exact) and the whimsical critters and wonderful, rich tones that come from the bells are definitely a collaboration. 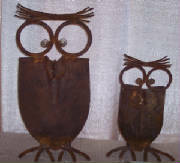 From start to finish they work together which includes finding the old, rusted and discarded metal tools, objects and other paraphernalia that becomes the sculptures of Yard Garb. 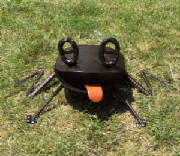 Who said these old rusty, discarded shovels can't have fun! This frog is a riot! Yard Garb was founded in 2000 when Jim and Holly decided to go to a sidewalk art sale in Norway, Maine. 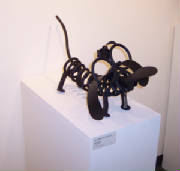 Some of the critters that had been made for the garden were taken and it was immediately obvious people like the work - it put smiles on everyone's face. 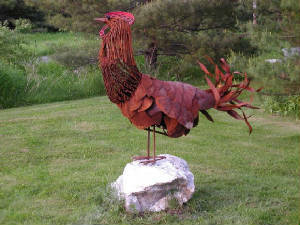 Since then hundreds of delightful critters have been created from just about every imaginable rusted metal part. 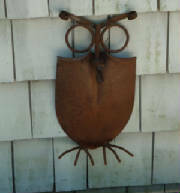 In fact, we are convinced we can weld all the rusted metal in Maine into something fun and enjoyable.